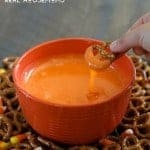 Serve this sweet Slow Cooker Candy Corn Fondue with salty pretzels for a fun Halloween treat! Place the white chips, candy corn and heavy cream into a 1.5 quart or larger slow cooker. Cover and cook on LOW for 2 hours stirring every 20 minutes. Serve with pretzels for dipping.